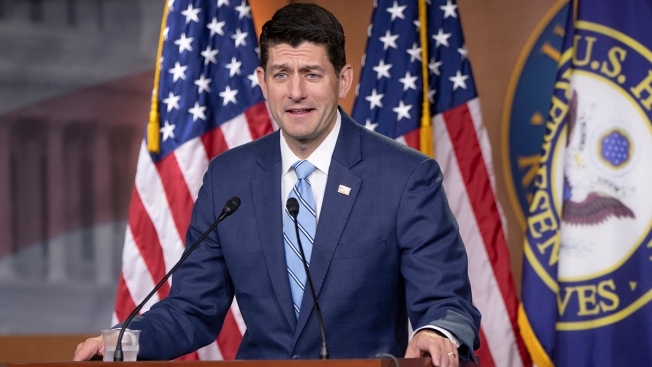 In this June 7, 2018, file photo, Speaker of the House Paul Ryan, R-Wis., takes questions from reporters following a closed-door GOP meeting on immigration on Capitol Hill in Washington. Ryan said party leaders would try crafting a compromise that follows President Trump's immigration proposals. House Republicans unveiled a "discussion draft" of a sweeping immigration bill that includes a path to citizenship for young immigrants, $25 billion in border security — including advance funds for President Donald Trump's wall with Mexico — and cuts to family-based visas in favor of those for immigrants with skills.